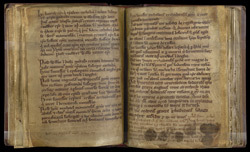 This is the unique manuscript of the 'Chronicles Of The Kings Of Man And The Isles', also known as 'The Manx Chronicle'. The original scribe wrote the text from the reign of Canute, in 1016, to the dedication of the Cistercian abbey at Rushen, on the Isle of Man, in 1257, and he also included a list of popes which ends with Pope Urban IV (1261-4). Following the chronicles are other texts relating to the abbey at Rushen. It is therefore probable that the manuscript was written for the new abbey a few years after it was founded. Immediately following the Chronicles is a list of the bishops of the church of Sodor, which starts 'These were the bishops who assumed the Episcopal seat in Man from the time of Godred Crovan . . .' The last entry by the original scribe is that for bishop Simon, who died in 1248; the following bishop, was Richard: he would have been in office when the manuscript was written, so it was apparently not thought necessary to include him in the list.